I have always enjoyed digging in the dirt and making mud pies. 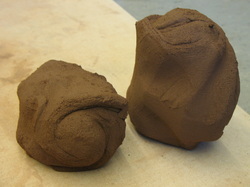 Today I am making clay sculptures and pots, testing, experimenting, and manipulating flexible earth. Although I feel I have merely scratched the surface of clay, through molding and shaping forms I have found a medium in which I am simultaneously excited and calmed. There is satisfaction gained from creative toil, a pleasure and peacefulness that speak to my soul. Working in ceramics presents innumerable creative variables and playful combinations relating to clay bodies, surface embellishments, and firing approaches. I am ever exploring and gaining sensory and experiential knowledge about the distinctive personality of clay bodies, vitrification and maturation temperatures, firing configurations, plus color, texture and chemistry experiments. Geology, chemistry, and math-- this process has revealed the harmonious inter-connectivity of science, math, art, nature and the resounding presence of the Creator in it all!